Elegant and high quality table lamps in chrom and brass from the interior of the Hotel Bar from the famous Munich Grand Hotel “Königshof” and they were made by Maison Jansen in 1968. 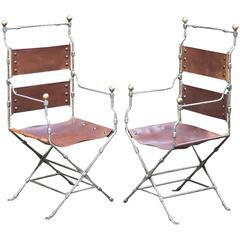 Beautiful Maison Jansen folding chairs with armrest in nickel iron base and brass balls, copper nits and brown thick leather, France, 1968. 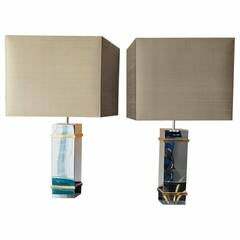 Gorgeous heavy made table lamp with bicolor steel and brass base and three solid Lucite shades which shines like a sun. 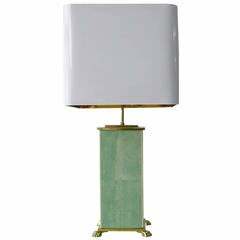 Table lamp in bronze, brass and sharkskin trompe l'oiel. (not signed). 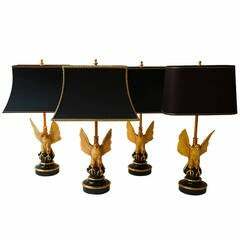 Highly rare Maison Jansen table lamps. 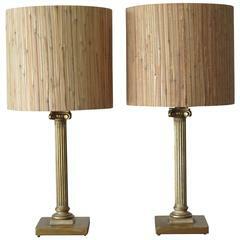 A pair of vintage 1940s Maison Jansen table lamps. Giltwood, original sockets, shades replaced. 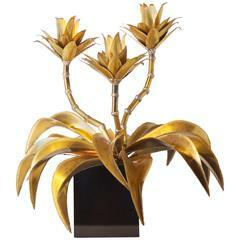 Beautiful Maison Jansen lamp with 4 lotus flowers The petals and metal work are in great condition Stands 105cm tall so can sit on the floor or a table (approximate 50cm wide).